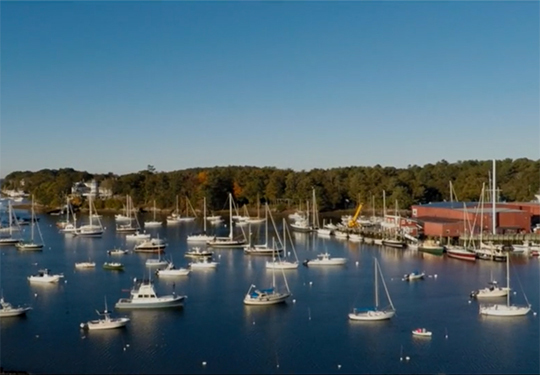 A historic New England boat yard where tradition shakes hands with the latest in marine advancements. For over a century, New England yachtsmen have trusted Manchester Marine with their most cherished possessions. We maintain a tradition of quality workmanship, integrity and customer service while incorporating new technologies and building techniques. Providing experience and skill in one of the most extensive full-service yards in the region. With an in-house staff of craftsmen, technicians and customer service professionals, Manchester Marine can tackle the full range of marine services. Many custom projects require skills from several of our shops. Our ability to bring these teams together under one roof ensures the highest level of oversight. We deliver the finest results. Our courteous and professional Customer Service staff will help you meet your yacht service needs. We will answer your questions, develop estimates, write your service and repair orders, coordinate projects and follow up to ensure your invoice is fair and honest. We will do everything possible to make your experience with us a pleasant one. At Manchester Marine since 2002 Steve gained strong project management and customer service skills in previous positions with General Electric and Day and Zimmerman. A life-long North Shore sailor Steve has owned and crewed boats in the local International One Design fleet for many years. His current boat is the Morris 38 WINGS. He is a member of the Marblehead Yacht Club. Luke started building Force 5 sail boats and DN ice boats as well as repair and re-fit on both wood and fiberglass vessels in 1994. He moved to the North Shore in 1997 and has been working in the repair and refit of vessels ranging from 15-70ft. Luke joined the team at Manchester Marine as a rigger and carpenter in 2016. In 2017 Luke moved his knowledge to the customer service department. He is an avid sailor currently racing Star sailboats and is a member at Sandy Bay Yacht club. Nick grew up sailing out of Quissett Harbor and working at local boat yards during the summer in his home town of Falmouth. He has spent time working in the Mediterranean on charter yachts and spent a short time in the commercial fishing industry. Nick joined the Manchester Marine team in 2001. With fifteen years of experience delivering boats up and down the New England coast and managing the MMC Rigging department, Nick brings his focus on customer satisfaction and attention to detail to the Production Manager position. Mike has over 23 years in the marine industry specializing in mechanical/electrical service and surveying, with 15 years spent running his own business in refit and management of large boat projects. Mike brings a keen focus on thorough inspections, customer interaction and on-time delivery to the Manchester Marine team. A Beverly native, Mike enjoys the peace and serenity of his family’s northern Maine lakeside cottage. Our sheltered harbor—a gem of the North Shore. 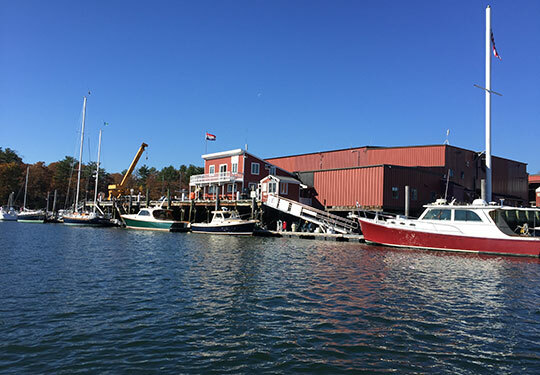 Located at the harbor of Manchester-by-the-Sea, Massachusetts, we offer our customers the perfect combination—a naturally sheltered location with quick access to open water and offerings that include slips, moorings and fuel dock facilities for permanent customers and transients alike. Mariners choosing both storage and dockage with Manchester Marine have long known of our unique abilities to handle any and all issues throughout all four seasons. We invite you to browse our site, contact us or stop by for a visit to see all that Manchester Marine has to offer! From 1892 to WWII – Early Boatyard, expansion of harbor and boatbuilding. We know that a marine railway was built on Cheever’s Point at the present site of Manchester Marine, in 1892. There were several small boatbuilding operations in Manchester’s shallow harbor at the time. When the Federal Government dredged Manchester in 1896, the new channel allowed for building larger boats. Some of the larger boats that were built at Calderwood were, the 45′ John Alden schooner “Abaco” (1922), the 32′ sloop “Spalpeen” (1922), the 23′ sloop “Merla” (1919) and the 35′ sloop “Azor Cole” (1919). Through the 1930’s Calderwood advertised his yard as “Builders of Yachts, Launches and Tenders” and offered to store boats for the winter. In 1935 additional dredging created mooring basins throughout the harbor and made the main channel 8 feet deep at low water. More boats were able to use Manchester’s protected harbor for moorings. Consequently, the service and storage business at Calderwood Yacht Yard began to grow. During World War II more than 125 men worked at Calderwood Yacht Yard. Eight wooden subchasers were constructed for the Navy. The subchasers were 110′ feet in length, displaced 75 to 95 tons, and carried 17-28 men. The Manchester-built sub chasers went on to have an impact on the war: SC 692 patroled the Mediterranean and took part in the invasion of Sicily while SC 1358 took part in the Normandy invasion. Others were involved in coastal patrols seeking out “wolf packs” of enemy submarines that were sinking tankers and other merchant vessels on the east coast. Post WWII to Present Day – Focus on Service and Repair at the Finest Yard Around. After the war, Gordon Abbott Sr. purchased the yard and renamed it Manchester Marine Construction Company. He was just out of the Navy and had owned boats all his life. His first efforts were to modernize the yard and to concentrate on service and repair. He built a number of fiberglass 16 foot gunning boats for the Navy. 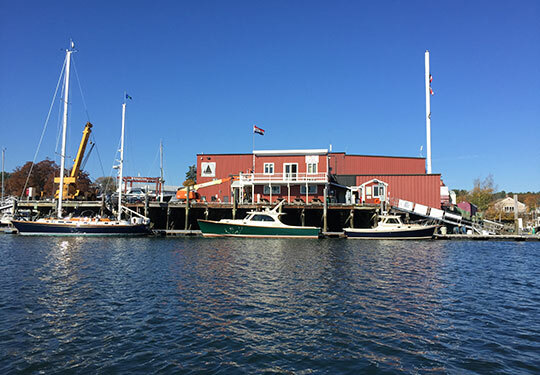 Over the 23 years Mr. Abbott owned the yard, he rebuilt the marine railway, built a large 10,000 square foot storage shed, and purchased the marina in the inner harbor. He operated two 120 foot fishing draggers which were maintained by the yard. He also established a Boston Whaler, Evinrude and Mako dealership onsite. After 20 years of successfully running the business, Mr. Abbott was ready to retire and the yard was sold to Thomas Sturtevant. Mr. Sturtevant continued to modernize the yard. A travel lift was purchased, a spar shed built and more dredging was done to create marina slips. The marine railway was rebuilt, the boat storage areas were extended and the retail store was expanded. For 20 years, the company operated successfully devoting itself again to service and repair. On September 13, 1989, there was a 10 alarm fire at Manchester Marine. The fire is remembered as a large conflagration. Ten neighboring communities and the U.S. Coast Guard assisted in putting the fire out. Only 3 boats were lost, but the offices of the corporation were a total loss. Many great historical photos, records and half hull models were lost in the fire. The yard recovered and continued. In the early 1990’s, Manchester Marine was purchased by the Northern Light Marine Group led by Rob Hoyle. With the purchase, Northern Light assured the continuation of yacht service and storage on this site in Manchester. As new facilities would need to be built, it was a great opportunity to modernize the yard again. 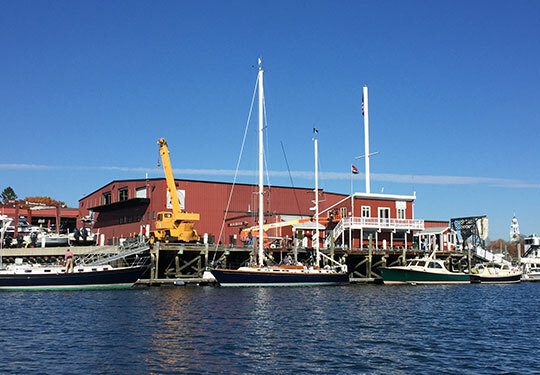 The focus of the yard shifted to outfitting classic boats with new technologies. The new storage shed was complete and fully functional in the spring of 1996. The new building afforded improved opportunities for completing major winter project work. In 2004, Steve Brox invested in Manchester Marine and attained majority shareholder status. A shareholder since 1992, Steve now serves as President and Chairman of the Board of Directors. Steve is dedicated to continuing the tradition of excellent craftsmanship and service for which Manchester Marine is known. Along with a highly skilled and dedicated team of employees, Steve’s commitment to continuous improvement will ensure that Manchester Marine retains it’s position as one of the Northeast’s finest yacht service destinations. Jeffrey’s Creek, Gordon Abbott, Jr.